Country superstar Brad Paisley allegedly once said, "a Tele is nothing more than a cutting board, a baseball bat and strings". And stepping up to the plate to meet that challenge is Zachary Guitars with this Ikea butcher block (SPÅR) Tele-style. Once this gets out, Ikea could become the next Stewart-MacDonald for those on a shoe-string guitar-building budget. 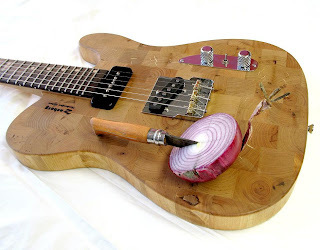 Also check out my earlier article on the Bambusa solidbody for a guitar that unintentionally looks like a chopping board. For the less adventurous DIY'er, may I suggest the Saga Tele-style guitar kit below.